One of my goals for this growing season is to experiment with grains. As I mentioned in my series on small-scale grain-growing, I'd eventually like to be growing most or all of the grains that we humans and our chickens eat. But my goal for the first year is far less ambitious --- I just want to experiment with a half dozen types of grain to find out which ones like our climate and fit our lifestyle. 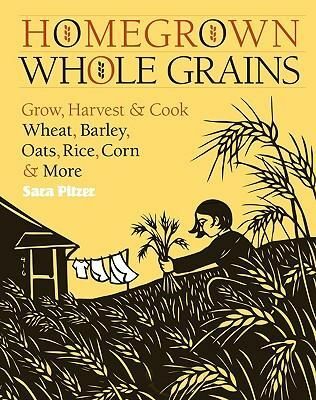 I got Sara Pitzer's Homegrown Whole Grains on interlibrary loan to round out the information I've been compiling. The book is very handy because it provides a lot of specifics I've been unable to find elsewhere about planting dates and growing zones. That said, quite a bit of the information in this week's lunchtime series has come from previous books and websites I've read on the topic, so don't expect to pick up Homegrown Whole Grains and find it all. Still, the book has lots of pretty illustrations and is a quick read, so I recommend it. I also recommend our innovative chicken waterer --- the best way to get chicks off to a healthy start.